This is the first of a new recurring feature at STARLOGGED: THE EAGLE COLLECTION. These were a series of full-page colour pin-ups, each spotlighting a different strip, that appeared sporadically in the weekly beginning with THE FISTS OF DANNY PYKE published in October 1983. 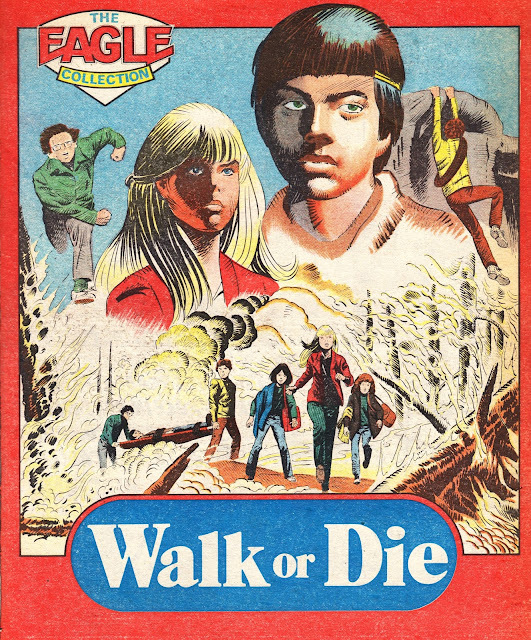 Walk or Die was the third in the (very) occasional series. These only appeared when one of the limited number of colour pages wasn't sold as advertising space which meant - in reality - they didn't appear very often. A total of seven appeared between January and May that year before the feature was quietly dropped. The WALK OR DIE strip was an ambitious holdover from the photo-story era. Basically, a group of kids, Lord of the Flies style, get stranded in the Canadian wilderness and have to overcome assorted adversity (injuries, wildlife, loony locals) as they trudge to civilisation. Basically, one of those strips that lasts as long as readers remain interested and the writers could concoct plausible survival scenarios. Switching to art work, and jettisoning the human cast, must have made things a little easier although - as I've said before - I'm something or a heretic and actually see the virtues of the photo-based format.